What is Remote Video Surveillance? Remote video surveillance enables users to view live video on a PC or laptop from just about anywhere in the world with internet access. After all, people lead busy lives, come in and out of work, go on vacations, and run errands so investing in a remote video surveillance system is crucial to the well-being and safety of your home or business. Thus, much of the time you’re not actually able to be onsite where your cameras are installed. One of the primary benefits of a networked surveillance camera system is that you’re not limited to viewing your remote video surveillance system on site. The advancements in video surveillance technology have made it possible to view your remote security cameras from any internet-enabled PC or smartphone. Well, in this day and age, virtually everyone uses a smartphone. 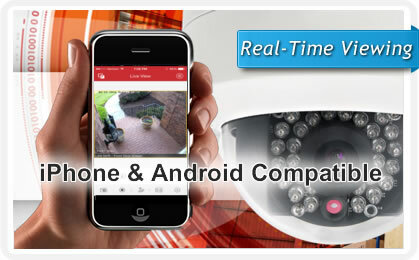 Remote mobile video surveillance takes remote monitoring to a whole new level. We utilize mobile surveillance apps that give you the ability to view and manage your security cameras from a smartphone or tablet such as the iPhone, iPad, or Android. These security camera apps allow you to view multiple cameras simultaneously, control PTZ settings, view recorded images, search through archived footage, play back events, and much more. Remote video surveillance is perfect for users who are often off-site, and therefore not able to be on the local computer system where their cameras are connected. What makes remote video surveillance and mobile monitoring so favorable is that they both fit within your busy schedule. Remote monitoring and mobile surveillance give you on-the-go, real-time access to view your live cameras so you can check up on your property anytime, day or night.